Some dealers are still clearing out 2017 stock. 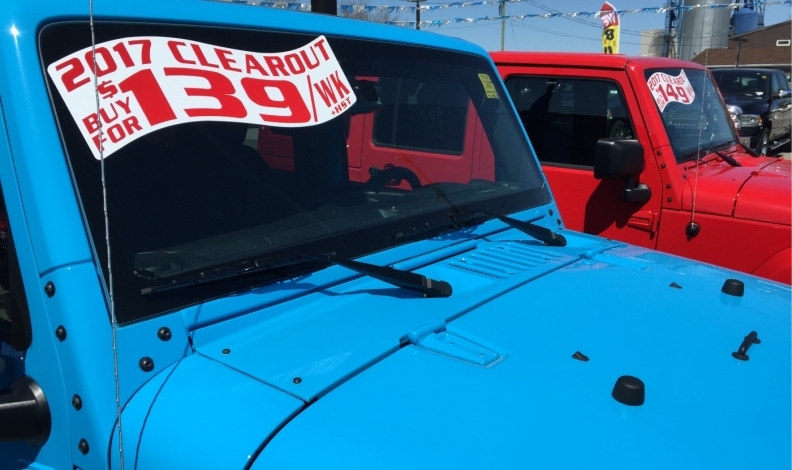 New-vehicle sales in Canada are expected to soften throughout the remainder 2018 because interest rates are expected to rise, Scotiabank warns in a new report. Canada, the United States and the United Kingdom are all expected to raise their interest rates two more times this year. That will affect auto sales. “Sales of big-ticket items that are more likely to be financed on credit, including motor vehicles, furniture, and major household appliances, are expected to soften first,” Scotiabank’s April 30 Global Outlook says. The financial institution forecasts that new-vehicle sales are to moderate to two million units in 2018, putting an end to a string of five consecutive annual sales records, but still keeping overall volumes at "extremely high levels." There were 2.04 million new vehicles sold in Canada in 2017, up 4.6 per cent from the 1.95 million sold the year before, according to the Automotive News Data Center in Detroit. New-vehicle sales are forecast to drop in seven provinces both this year and next, Scotiabank predicts. Only Alberta is forecast to see a gain in auto sales next year, while sales in Prince Edward Island and Saskatchewan will remain the same. Scotiabank also notes that new vehicles are becoming less affordable and used vehicles more attractive.